Finally got one of these guys painted up... he came out alright I think. As a squad, they should look the part with the other guys models on the table. I'm not gonna lie, I struggled a bit with the color scheme on this guy. According to the fluff, these guys (Inheritors) are silver with blue boots/greaves and gloves. All the other guys got a handy picture of what they're color scheme looks like. Me, I got nothing but a line of text. It's a tough color scheme to make look good. I wanted to make sure I stuck to what the guys at Fantasy Flight gave us, because I feel like they trusted us to do the right thing with the army and not produce some off the wall units and crazy color schemes. I decided to use two different kinds of metals on the model. One for the armour and one for the weapons to differentiate between them. I did a little more than line highlighting on the blue since it's the only real color on the model and I wanted it to look on par with the metals on the model. 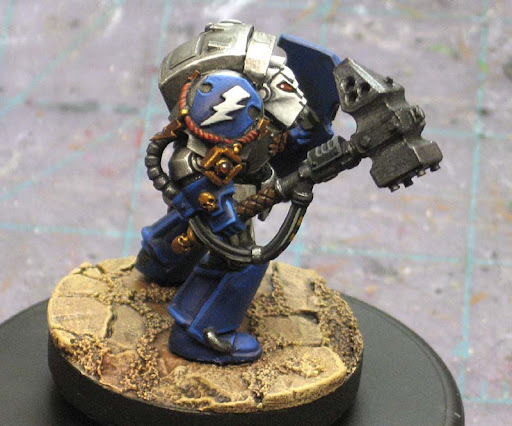 I went back and forth on the white helmet, but decided to keep it in the end since the Chapter follows Codex markings and Veterans usually wear white helmets. I went with red for the purity seals and other elements since the fluff mentioned red as the color they use for honor markings. I didn't add anything extra to the model when it came to painting, I did all that with building them. I'll have a step by step on how I painted each part in one of my upcoming posts, this one was just to give you guys a glimpse of what they will look like when finished. With just about a month left in the project, make sure you get involved and donate to the cause. There's lots of great stuff up for grabs each week (including this weekend) so check out the Project blogroll on the right for the latest updates from all the guys involved in the project. Once I get these guys done, I've got a Standard Bearer waiting for me. That looks absolutely smashing. Awesome. Nice shading on the metal. Brightened up blue highlights. I like the gold lighting as well. All in all very very cool. Puts GWs Terminators to shame sans Space Hulk. Only thing I would suggest would be to brighten the lenses of the, ehm, thing next to the helmet. The red feels dull and making it look like there was a light behind it would increase the contrast of the painting. I especially love the shield. That purity seal on it looks just perfect. Flekkzo: Good catch, I went through and added reflections and highlights to the lenses in the sensor array. I'm actually alomst half way through the squad now and hope to have all of them posted by the end of next week maybe. The shading on the blue and metal parts is glorious. Superb job Ron! This guy is awesome. You are to hard on yourself, Ron. This is going to be a very solid unit. Excellent. The unique shield really sets it out from any other terminators I've ever seen. I think I'm going to do some more research on how to mark the squad number and maybe add that to the models. After that, it's time to start the banner bearer. You'd win really easily playing with these. No opponent would ever want to see a model that amazing removed from the table so they wouldn't ever shoot at them. 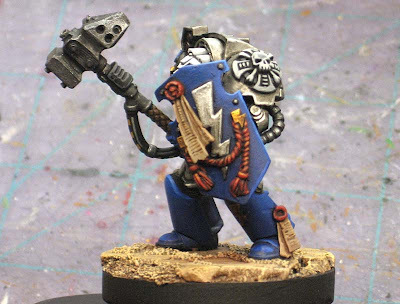 just a quicky, what blue did you use for the models? 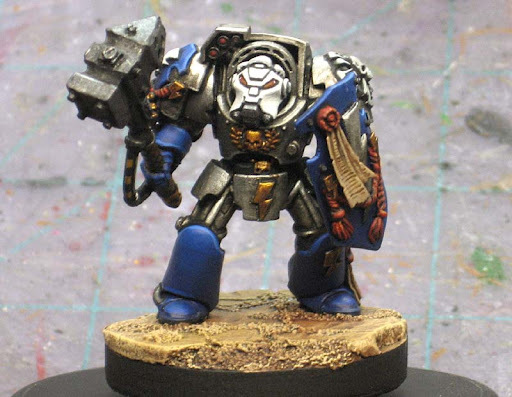 also thinking about it were the Storm Wardens pads are released for sale from anyone in the project? Millest: Here's the link to the painting guide I did on these guys. Hope it helps. And the pads were not released. We were allowed to use them for the project only. Selling them would have been inappropriate. thanks mate ill pass it on, he was hoping there may have been a way round it.